Indication : Vincristine sulfate is indicated in acute leukemia. 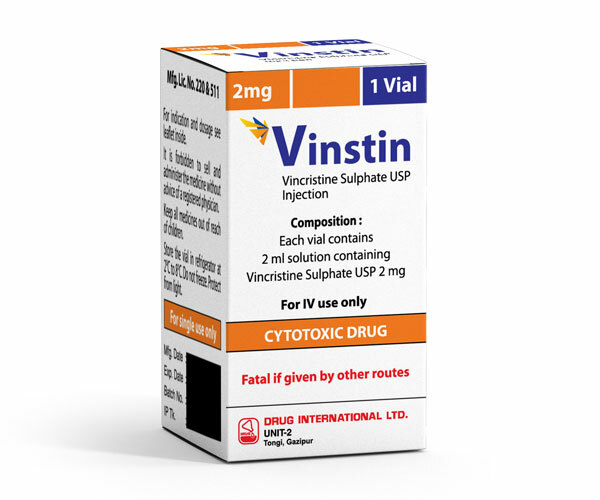 Vincristine sulfate has also been shown to be useful in combination with other oncolytic agents in Hodgkin's disease, non-Hodgkin's malignant lymphomas (lymphocytic, mixed-cell, histiocytic, undifferentiated, nodular, and diffuse types), rhabdomyosarcoma, neuroblastoma, and Wilms'tumor. Dosage and administration : Extreme care must be used in calculating and administering the dose of vincristine,since overdosage may have a very serious or fatal outcome.The drug is given i.v. at weekly intervals. Fatal if given intrathecally.Adults: The usual dose of vincristine is 1.4 mg/m2. Children: The usual dose of vincristine is 1.5- 2 mg/m2. For children weighing 10 kg or less, the initial dose of vincristine should be 0.05 mg/kg once a week, with careful increasing of dosing thereafter based on effects. Vincristine should not be administered to patients receiving radiation therapy through ports that include the liver. When vincristine is used in combination with L-asparaginase, it should be given 12 to 24 hours prior to administration of the enzyme in order to minimize toxicity because L-asparaginase may reduce hepatic clearance of vincristine.Or, as directed by the registered physician. Please see prescribing description for more information. Use in pregnancy and lactation : Category D. There are no adequate and well controlled studies in pregnant woman Vincristine has been reported to be found in human milk. Patient recieves Vincristine should not be breast feed. Packing : Vinstin : Each box contains 1 vial of 2 ml. © Copyright Drug International Ltd. 2019 Designed and Developed by ATI Limited.